The safety of our customers is very important to us, so as a precaution in collaboration with the Consumer Product Safety Commission we’re actioning a voluntary recall of this product due to two reports that there is a potential for the ball at the end of the beater stick to separate presenting a choking hazard. No injuries have been reported. 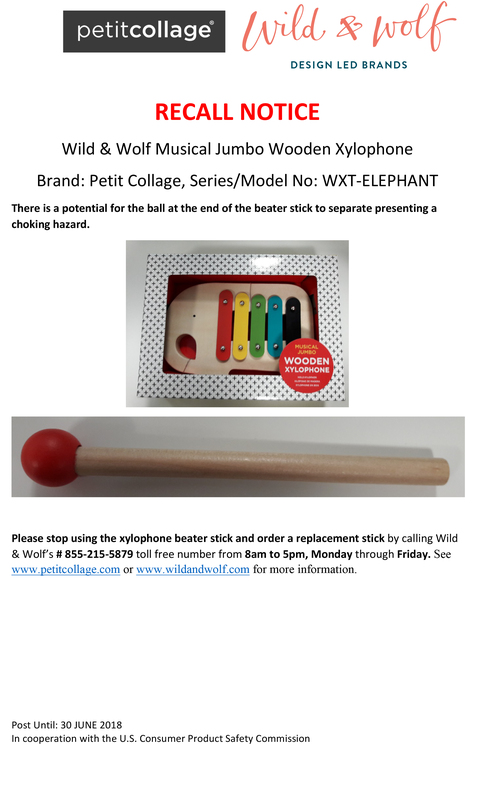 Customers who have purchased this product or received it as a gift are asked to please stop using the xylophone beater stick and order a replacement one-piece stick free of charge by calling Wild & Wolf’s #855-215-5879 toll free number from 8am to 5pm, Monday through Friday EST. The safety of our customers is our top priority and we are very sorry for any inconvenience or disappointment this product recall causes. All retailers where this has been sold will be contacted directly.